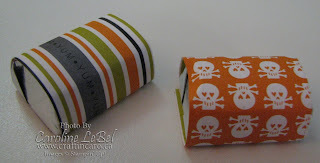 Craftin' Caro: October Club project #1: Chocolate Halloween Spiders! 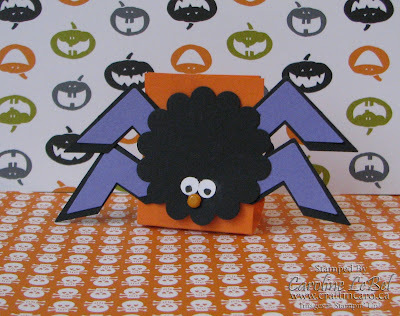 October Club project #1: Chocolate Halloween Spiders! Here's hoping that none of the gals attending my October Club nights this week are deadly afraid of spiders... chocolate spiders, anyhow! There little cuties were adapted from an idea I saw done by fellow Founder's Circle achiever Lisa Freeman, only her treaties used Peppermint Patties between two black scallopped shapes. Mine is a standing treat, with a chocolate Hershey Nugget on the inside, all wrapped up in the Ghostly Greetings designer paper. I think it would almost be a shame to open this cutie up to eat the chocolate! Club members, full instructions are posted on the Club blog HERE.